Originally published in 1987. 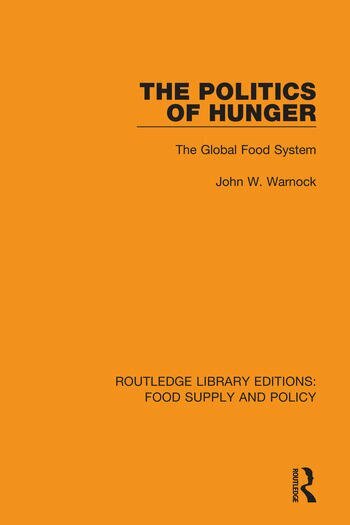 This important and provocative book explains the persistence of hunger, poverty, and the lack of balanced development in many countries and the central role of agriculture in economic development. Most theories of agricultural development are based on the experiences of western Europe and the United States while the two models for successful "late development" have been Japan and the Soviet Union. This book surveys the evolution of agriculture under colonialism in Latin America, Africa, and Asia and concludes that this long period distorted the development prospects for these areas and retarded the production of food. Under strong state capitalist governments, a few underdeveloped countries have broken the colonial patterns of development. However, other post-revolutionary societies are having far less success because of economic blockades and outside military intervention. While the primary focus of the book is on the short-run problems of inequality, the author examines the long-run ecological and resource constraints to a sustainable food system and raising the standard of living in the underdeveloped world.